Indie spotlight is a regular column focussing on indie authors and self-publishing. 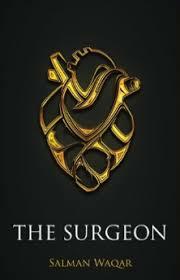 The Surgeon is a work of science fiction recently self-published through Createspace by U.K based, Pakistani-born eye surgeon Dr Salman Waqar. It imagines the shape healthcare might take in the years ahead and explores the profound ethical questions that advances in medicine will provoke worldwide. The Surgeon is set in London in 2030. By this time, advanced robotic systems are commonly used for surgery. Mortality and complication rates are non-existent, even in operations that were once considered perilous. But now a prominent politician, and close friend of the UK Prime Minister, dies during routine heart surgery. Why? It seems a killer doctor is on the loose. Join Professor Daniyaal Ashraf, a prominent surgeon originally from Pakistan, as he teams up with the medical authorities, Scotland Yard and even the UK intelligence services, to stop the culprit before more innocent lives are compromised. Here, Dr Salman Waqar talks about his motivation and inspiration for writing The Surgeon. I work within the UK National Health Service (NHS), a profound model of healthcare. It was originally developed from the ashes of World War Two, and has for over seventy years aspired to provide universal healthcare to residents of the U.K. However, it is seldom represented in the mainstream media as a backdrop for an exciting story and I wanted my novella to frame it in this light. In addition, doctors from the Indian sub-continent have made significant contributions to developing the NHS and I wanted to write a story that not only had a protagonist from this background, but also celebrated the diversity of the NHS and of British society at large. I grew up reading doctors such as Michael Crichton and Robin Cook, who took their medical expertise and merged this with the science fiction genre thereby creating awe-inspiring and thought-provoking tales. I also learnt a lot about law by reading John Grisham and I wanted my story to bring medicine and medical ethics to the avid reader in the same way. Pakistan is a lovely country. I have very fond memories of growing up there and still visit my family once a year. Its cultural, geo-political and religious issues are very complex and multi-faceted, and I always find it difficult to accept a unilateral negative depiction of the country. Through my novella I hope to highlight its positive aspects, whilst also introducing the reader to the many shades of grey that colour this extraordinarily complicated country. There is always a web of events that lead to the decisions we make, but the world would be so much more tolerant and peaceful if we could all understand the unique stories that pave the way to our decisions.